The government will use proceeds from the second Eurobond of up to $1 billion it plans to issue next year to fast-track the construction of Bugesera International Airport and a 150 megawatt power station, Amb. Claver Gatete, the minister for finance and economic planning, has said. Amb. Gatete was confirming President Paul Kagame’s announcement on the sidelines of the US-Africa Leaders Summit in Washington DC on Tuesday. The President told reporters in the US that Rwanda would more than double the amounthey sought in the 2013 $400 million external bond to up to $1 billion. 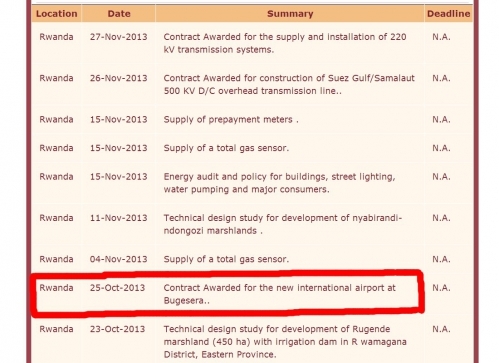 “For the Bugesera International Airport, we are still negotiating with the private sector. We have to understand the role of their engagement and that of the government so that we know the exact contribution from the government,” Amb. Gatete said. In April last year, government issued $400 million bond to fund the completion of the Kigali Convention Centre and RwandAir’s expansion programme, which was more than eight times oversubscribed. The Minister of Infrastructure, Eng. Linda Bihire, has said that the construction of Bugesera International Airport (BIA) is currently estimated at US$350million (Approx. Rwf 197billion). 70 percent of the design of the state-of-the-art airport that will be built in the Eastern Province is complete. “The total cost of the airport is estimated at US$350m but this amount is subject to change and may go below the figure,” Bihire said during an exclusive interview with The New Times on Thursday. 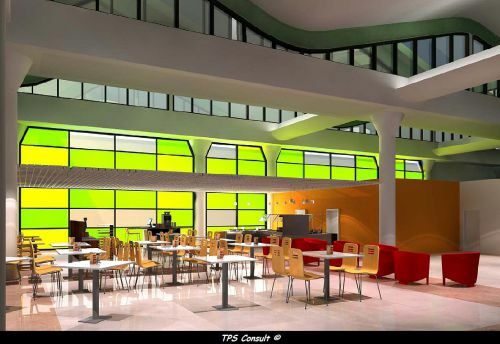 A British engineering company, TPS Consult, is doing the design work of the new airport. She added that once the construction kicks off, it will take 30 months to be operational, but however added that the government has not yet got enough investors to inject in funds. The airport is expected to be constructed through Public-Private Partnerships (PPPs). “Once the funds are available, the construction will kick of immediately,” said Bihire. The airport is designed to handle 450 passengers per peak hour and over 1 million annually during its first phase. 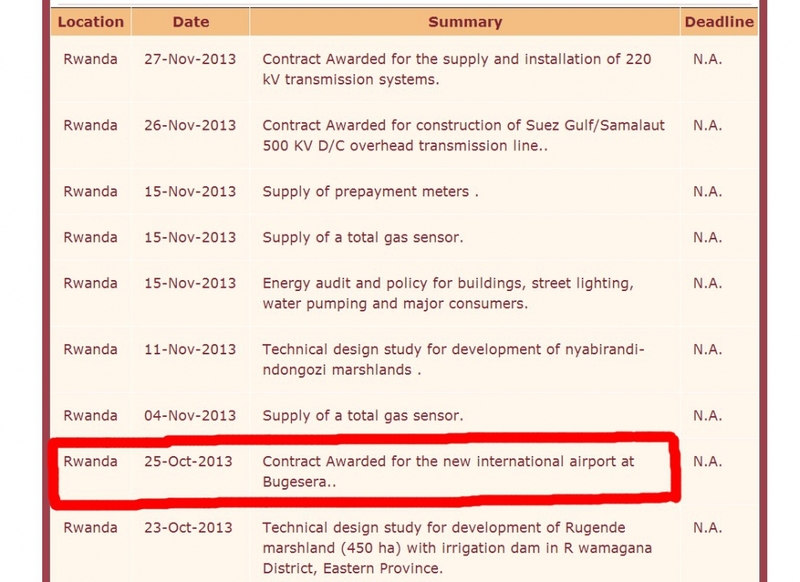 Contract for the Bugesera Airport finaly awarded ? 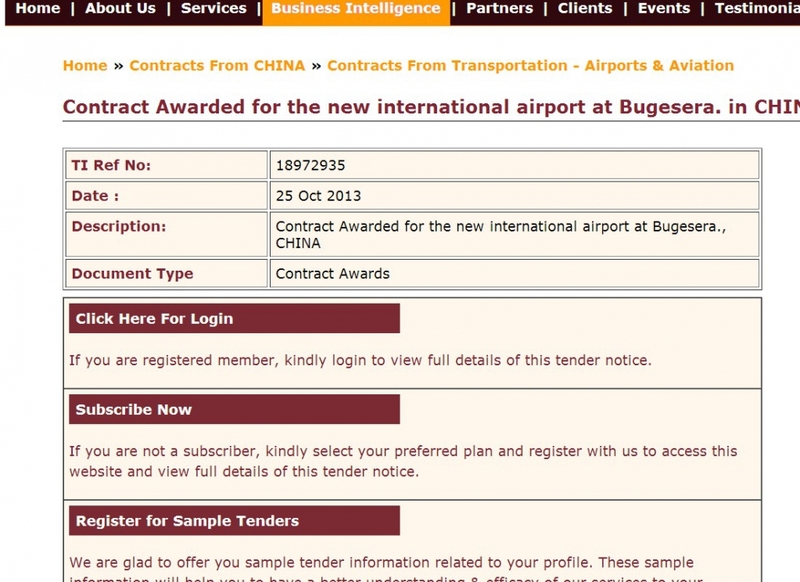 According to the Indian website Tenders Info, a company won the tender for the Bugesera Airport. 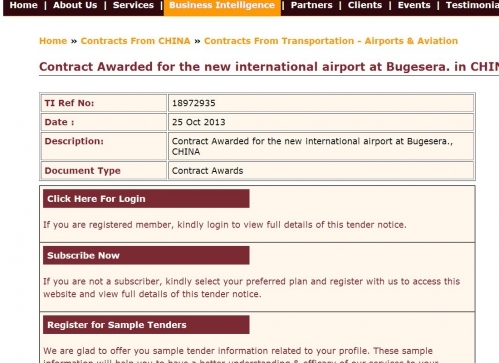 The website shows that the contract was awarded on 25 October 2013. Last informations from the Governement said that the compensation phase is nearly completed and the governement has shortlisted 3 companies (2 from China and 1 from USA). East African News Paper said : Silas Lwakabamba, the Minister of Infrastructure confirmed that the government was finalising negotiations with China State Construction Engineering Corporation (CSCEC). The firm won the deal expected to cost over $650 million. This is the largest investment in Rwanda’s history. According to Igihe (HERE), the Permanent Secretary in the Ministry of Infrastructure (MININFRA), James Kamanzi has refuted media reports which indicate that government has contracted the China State Construction Engineering Corporation (CSCEC) to construct a multi million dollar modern Airport at Bugesera district. “Its not true that any contract has been awarded to the Chinese(CSCEC),”Kamanzi said adding that three companies have been shortlisted including two from China and another from U.S.
Kamanzi said he could not reveal the names of other companies shortlisted. “We will hold negotiations with all the shortlisted companies but we have began with CSCEC. After negotiations with the three firms, we will announce the winner." He told IGIHE in an exclusive interview that Government is in negotiations with CSCEC to determine whether it meets the criteria in taking up the job, “We are currently holding both Technical and Financial negotiations with CSCEC”. Kamanzi explained that Bugesera airport construction will commence between August and September 2013 and scheduled for completion between 2016 and 2017. We will made update in coming weeks. Watch this space. And we are sorry, we will have to wait for some month, before to know the name of the firm^^. After month of silence, the Governement of Rwanda has announced the name of the firm that will built the New Bugesera International Airport. According to the East African.co.ke, "the firm which is based in China, is China State Construction Engineering Corporation (CSCEC). The firm won the deal expected to cost over $650 million (the budget was several changed). This is the largest investment in Rwanda’s history". The Governement of Rwanda is currently in talks with CSCEC to raise funding from Exim Bank. Exim funds are usually concessionary loans that attract low interest rates and whose repayment is spread over a long period of about 20 years quoted East African. Bugesera International Airport will become Rwanda's largest International Airport, serving commercial flights destined to and from the greater Kigali metropolitan area. The new airport is expected to handle three million passengers annually. The first phase of the construction begins this year, and is expected to end in 2017, at an estimated cost of $600 million. The construction includes a 4.2 kilometre-runway and cargo and passenger terminals capable of handling 1.8 million passengers annually. Kigali International Airport(KIA) upgrading and improvements of Terminal Building and other facilities are in progress. So far site installation, excavation, structural analysis and design drawings are done waiting to provide samples to the site Laboratorians for go ahead. The upgrading and improvement of KIA is being carried on by an International construction company( ROKO Construction company) a Switzerland based company. 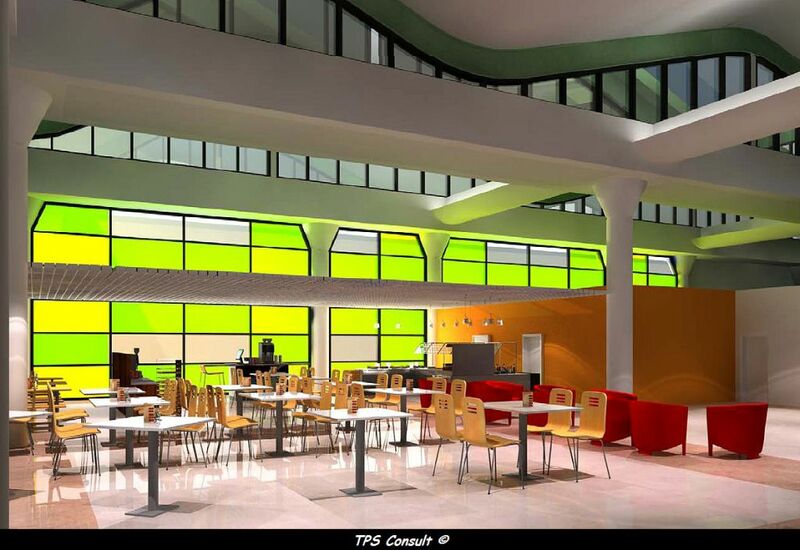 Works will be finished on December 2013. Founded in 1982, CSCEC has been a backbone enterprise directly under the management of the central government. Starting as its core businesses of housing construction, international building contracting, property development, infrastructure construction and municipal survey and design, CSCEC has finally grown up the largest building and real estate enterprise in China, as well as the top international contractor in China. CSCEC is an enterprise expanding itself without mass capital and sources from the government, but only through competition. And it is the only building enterprise holding three highest class qualification certificates in China.